There are no bad does in my small flock. If there were one, it would be culled. To new readers, that’s code for “slaughtered.” You may notice my non-use of the polite “processed.” Not feeling euphemistic. For some reason. 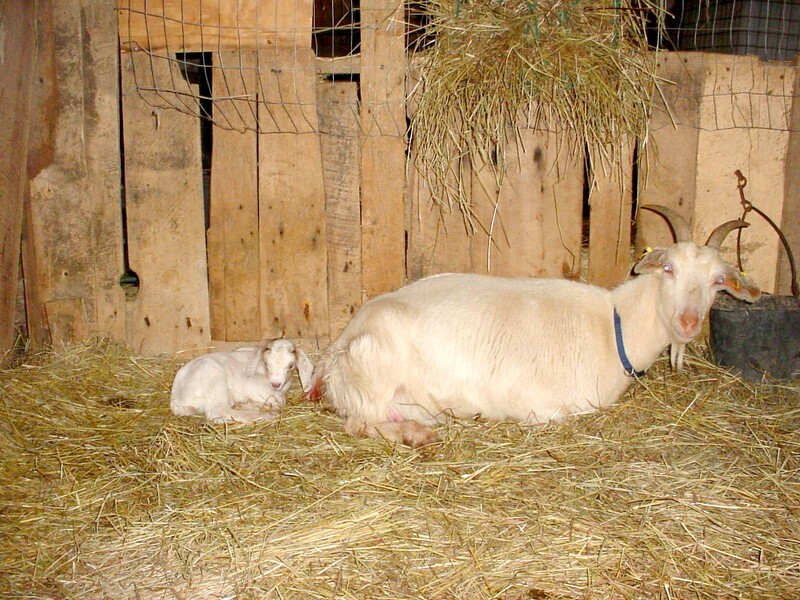 Hy’s first kid, 2009 – a single, but a fine buck: born when my back was turned. But if I had to pick a “best” – be tough, as all have good points and quirks of personality – off the top of my head, it would be Hyacinth, 4-year-old half-Togg. Trill is a fine milker, less good at mothering, from having lost her first set of kids at birth. 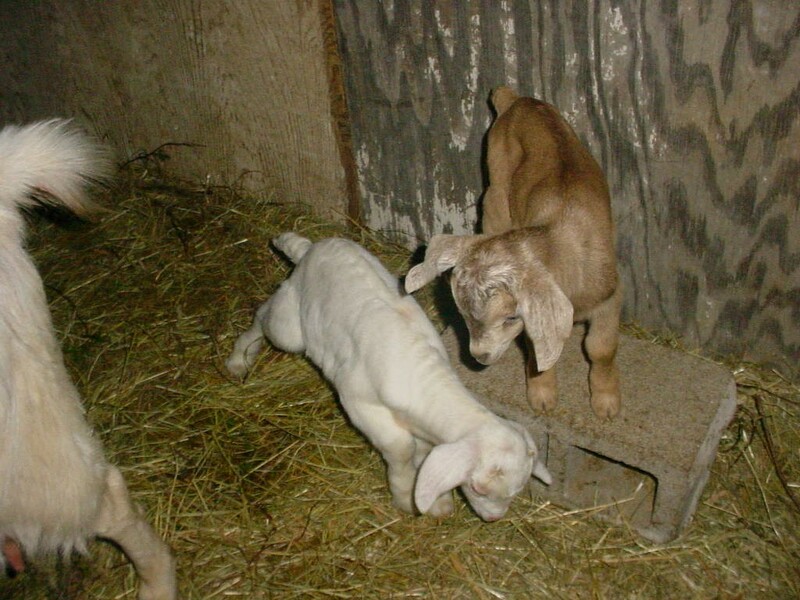 Columbine is a reliable breeder, but pure Boer kids are on the lanky side, compared with the Toggenburg crosses. Hy’s twin, Jonquil, breeds well (8 kids/3 seasons), but is stubborn (and very strong). Etc. 2 of fine triplets in ’12, raised to sale or slaughter, no problem! Born when my back was turned. Normally I’d wait for the outcome and then post. It’s a job keeping these musings in a positive – not to say lighthearted or even chirpy – tone. Today I don’t have the energy. For some reason. 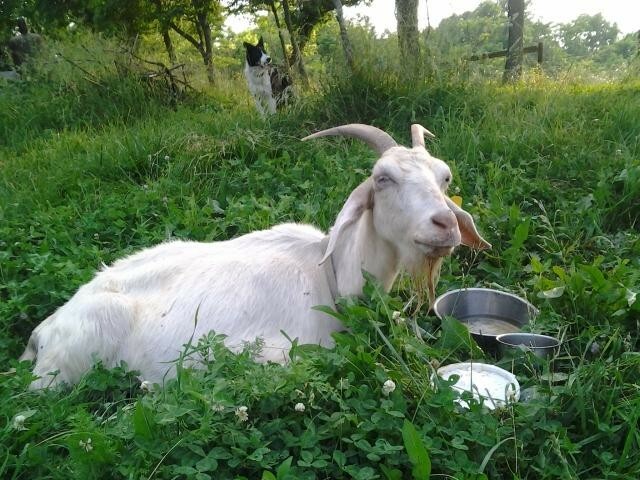 Often someone approaches to say how they would love to have goats, and how lucky I am. Or to urge me to sell them goat’s milk – which is not in the cards. My usual answer is to invite them to the farm, to share milking in return for the milk, to learn about worming and hoof-trimming in return for an extra hand with these 3-handed chores, or to help clean stalls and take home some good garden compost. Whatever suits them. That’s a bit of “put up or shut up,” innit? It quickly becomes apparent how serious some are. You know who I mean, dear people. This is for everyone else who thinks they would “love to have goats” and how “lucky” I am, and who, after one taste (if that) of what’s involved, drift off smiling weakly. 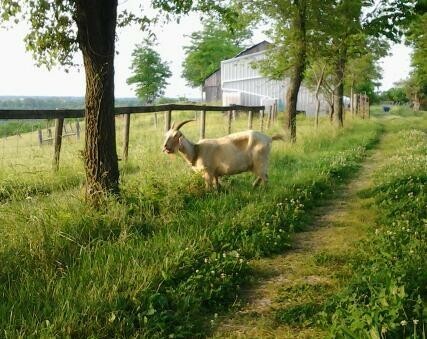 When Hy’s buck kid, “Moose” was processed, and her daughters Rosie and Carnation went to their beautiful new farm at Alexandria, she became the second milk goat. Her yield wasn’t as high as last Summer, but I laid it to having raised triplets and beginning to wean them. Then she started to lose weight, and appetite. One reason she counts as “best” is that she is the most tireless browser ever. When a few raindrops hit, and the rest of the flock high-tails it for shelter (dryland-bred Boers in the lead), she stays out feeding, with her kids, till it’s a positive downpour. When the clouds merely begin to shift, Hy is the first one back out. So she’s always carrying good flesh. Easy birther, heavy nurser, good and willing milker. When should I have said, “Wo, that’s more than a touch of toxemia” when she began staying away from the flock, lying down, and even staying in when they escaped? “Oh, good girl, Hy!” – not. How much sooner should I have stopped milking and started tonic, so when she refused it, I might have known there was a bigger problem? Was “bottle jaw” (facial edema) there a day before I noticed it? White eyelids? Two days? Listless, gaunt, puffy-eyed, dull-coated, anemic – should have been enough, days ago. Well, while you enjoy images of sleek, contented grazing does, bouncy newborn or weanling kids, and think how great it would be to have goats of your own, here’s a quick lesson in one of the less appealing challenges of goatherding. Haemonchus contortus – “stomach worms,” bloodsuckers which deprive a goat of most of their nutrition intake, turning their eyelids and gums white, wasting their muscles and robbing them of appetite and energy. Untreated, or treated late, it can kill. It remains to be seen, if it’s not too late for 5 days of anti-parasitic (now on day 3), bicarb (to correct rumen pH), straight molasses (iron tonic) and every delicate, succulent leaf I can gather that might tempt her appetite, to make her turn the corner. Usually, if the problem is caught in time, the goat will feed out again, glossy and lively, within weeks. If that happens, I will be sure to share the news and images. This time, for some reason, I felt like sharing the anxiety. Those hollow flanks and shoulders are NOT normal. But she’s up, browsing, a good sign. And the thanks: Julie, for work and worry: Pam & Steve for errands and concern: Larry and Leslie, for good advice (Hope the hay is going OK! ): and yesterday the entire customer base (seemingly) of the Bellevue Farmers Market, for listening and caring. Another lesson for would-be goatherds: there’s no doing it without help.